Your resume should have substance as well as style. Review this sample to see how you can portray your full creative abilities to employers. Your resume should have substance as well as style so you're noticed for the best graphic designer jobs. 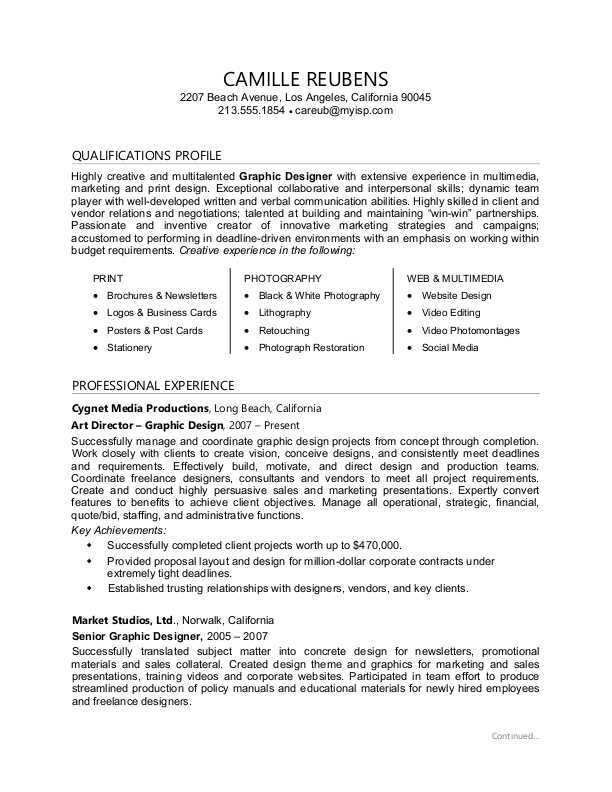 To see how you can portray your full creative abilities to employers, review our sample resume for a graphic designer below, and download the sample resume for a graphic designer in Word. Jobs for graphic designers are projected to grow by 4% (or 11,100 jobs) from 2016 through 2026, according to the Bureau of Labor Statistics (BLS). You'll find the highest level of employment for this job in the following states: California, New York, Florida, Texas, and Illinois; and in the following metropolitan areas: New York City, Los Angeles, Chicago, Atlanta, and Washington D.C.
As a graphic designer, you can expect to earn a median wage of $48,700 per year, or $23.41 per hour, according to the BLS. Additionally, you can learn about creative design careers and search for graphic designer jobs on Monster. Highly creative and multitalented Graphic Designer with extensive experience in multimedia, marketing and print design. Exceptional collaborative and interpersonal skills; dynamic team player with well-developed written and verbal communication abilities. Highly skilled in client and vendor relations and negotiations; talented at building and maintaining “win-win” partnerships. Passionate and inventive creator of innovative marketing strategies and campaigns; accustomed to performing in deadline-driven environments with an emphasis on working within budget requirements. Successfully manage and coordinate graphic design projects from concept through completion. Work closely with clients to create vision, conceive designs, and consistently meet deadlines and requirements. Effectively build, motivate, and direct design and production teams. Coordinate freelance designers, consultants and vendors to meet all project requirements. Create and conduct highly persuasive sales and marketing presentations. Expertly convert features to benefits to achieve client objectives. Manage all operational, strategic, financial, quote/bid, staffing, and administrative functions. Successfully completed client projects worth up to $470,000. Provided proposal layout and design for million-dollar corporate contracts under extremely tight deadlines. Established trusting relationships with designers, vendors, and key clients. Successfully translated subject matter into concrete design for newsletters, promotional materials and sales collateral. Created design theme and graphics for marketing and sales presentations, training videos and corporate websites. Participated in team effort to produce streamlined production of policy manuals and educational materials for newly hired employees and freelance designers. Earned several awards for providing graphic design support to both headquarter employees and hundreds of field offices. Created new design themes for marketing and collateral materials. Collaborated with creative team to design and produce computer-generated artwork for marketing and promotional materials. Participated in production of print and promotional items for key clients under direction of Marketing Department. Consistently recognized for fresh and innovative ideas and applications. Developed new art-proofing system that increased overall quality of production and improved customer satisfaction to 97%. Recruited by ABC Corporation to become their Senior Graphic Designer. You may not consider a resume a work of art, but there are for sure good-looking ones and not-so-good-looking ones. You want your resume to land squarely in the first camp. Could you use some help making sure it's a solid representation of your talents? Get a free resume evaluation today from the experts at Monster's Resume Writing Service. You'll get detailed feedback in two business days, including a review of your resume's appearance and content, and a prediction of a recruiter's first impression.